This past week was spent building on my last project for the Learn-Verified program. 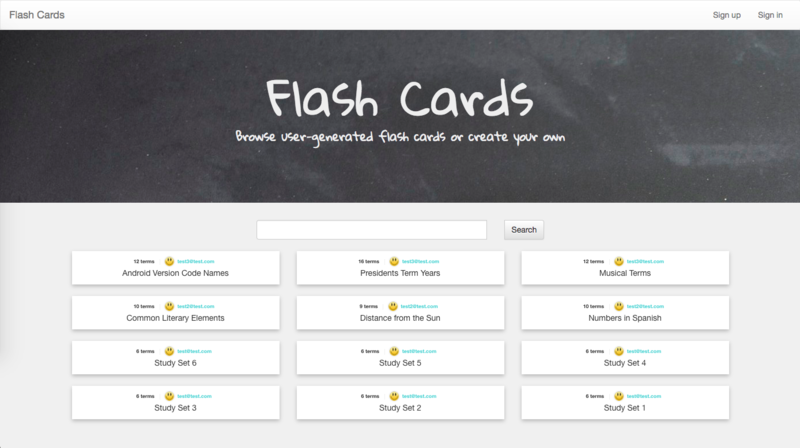 My Flash Cards app just got a fancy jQuery upgrade! At least one JS Model Object must have one or more methods on the prototype. Must have at least one #index action rendered using jQuery and the JSON response. Must have at least one #show action rendered using jQuery and the JSON response. 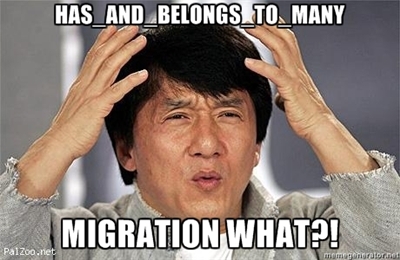 The rails API must reveal at least one has_many relationship in the rendered JSON response. Create a resource using an AJAX POST request, and render the newly created resource without reloading the page. As it turned out, most of these requirements could be fulfilled while working with my StudySet model. Let’s take a look. Fortunately, Rails makes rendering an ActiveRecord model easy with render json: @model_name in the controller. The root path of the Flash Cards app is my study_sets#index view. As you can see, there is a search bar to filter through the list of all study sets. Pressing the “search” button loads an jQuery AJAX GET request. If you don’t know about Handlebars JS templates, you can find out more here. The array of transformed study sets are placed into an object assigned to the variable str. str is then rendered in the index page through the compiled Handlebars template. This takes care of requirements 1, 2, and 4. Passing the number of flash cards to the Handlebars template takes two steps. The first is creating a method on the StudySet object. The flashCardCount() method returns the length of the flashCards array. One would think that is all we need, but unfortunately Handlebars templates can’t read functions natively. In order to introduce some logic, we need to register a Handlebars helper. Now the flashCardCount() method is accessible in the Handlebars template like so: ``. Pretty cool! Now we have requirements 3 and 6. If you read my last post, you may have seen the “Study mode” I created in the study_sets#show view. Study mode renders the flash cards within a study set as actual cards that can be flipped on click. In order to meet the requirement to render a show view without reloading the page, I opted to refactor my study mode feature. The method is simply responding to a GET request. The “Search mode” button has a data-id attribute and data-ownerId attribute to build the nested URL for the request. “Study mode” only works if a user is logged in, so we have an error handler to add a flash alert to the page if a guest tries to press the button. Requirement no. 5 is in the books! The biggest challenge I had was with creating a new resource. Manipulating data is always a little trickier than simply reading it. My idea of an “add a flash card” button in the StudySet show page seemed to fit the bill well. I opted to keep my event handler for the form submit in study_sets.js because the event is called within the study_sets#show view. //reset "add flash card" button and form". Lo and behold, the final requirement is met! Easily the biggest frustration I had with this project was fighting against event-handling. With so many event handlers set up for specific pages, my initial solution was not working. In the end, I found something that was satisfactory: Class-based targeting. In my application.html.erb layout, I added a couple variables to the body class. The call to $(document).on() ensures that the event is bound to the document. The event may not bind to the element if it is not loaded initially. The middle parameter with ".study_sets.show" is where class-based targeting comes in. It is providing the context of the study_sets#show view. The " #studyMode attribute is the actual element we are targeting. If you are having issues with buttons not working on click, or only working sometimes, consider using class-based targeting.